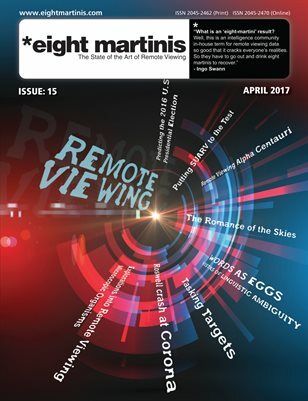 Eight martinis – the state of the art of remote viewing: Each issue is packed with remote viewing articles, theories and examples. All issues are in full color and are FREE to download or you can also order printed copies for yourself using print on demand at cost price. 06.01.06 – The Coming Importance of the Question: Can the Superpowers Be Trained? The truth is out there – finally!! The Society for Scientific Exploration (SSE) is a professional organization of scientists and scholars who study unusual and unexplained phenomena. Subjects often cross mainstream boundaries, such as consciousness, ufos, and alternative medicine, yet often have profound implications for human knowledge and technology. As a result of a Congressionally Directed Activity, the Central Intelligence Agency conducted an evaluation of a 24-year, government-sponsored program to investigate ESP and its potential use within the Intelligence Community. The American Institutes for Research was contracted to conduct the review of both research and operations. Official quest for ‘another reality’: Crystal ball had a place next to cloak and dagger – Richmond Times-Dispatch, Richmond Virginia, 29 November 1995. Up Close & Personal with a Remote Viewer: Joe McMoneagle Defends the Secret Project (from Joe’s web site) The Washington Post, 04 December 1995. ABC puts Nelson man’s psychic skills to the test – The Daily Progress, Charlottesville Virginia, 30 November 1995. Psychic’s government role revealed – Nelson County Times, Nelson Virginia, 07 December 1995. Nelson man used psychic techniques for the government (source unknown; Lynchburg Virginia news) 30 November 1995. Joe McMoneagle – Magical blend magazine, issue 52. Is It Smart to Buy Remote Viewing Materials by Ed Dames? – top secret writers. Quantum entanglement and Long Distance Cryptographic Communication – top secret writers. The Star Gate Remote Viewing Project – Part II – top secret writers. The real story behind Indigo children – top secret writers. Indigo Children part2 – top secret writers. Free Psychic Readings – Authentic or Fraud? – top secret writers. Future Feeling – Is There Evidence that Humans Can Predict the Future? – top secret writers. Searching...By Daz Smith – eight martinis issue3, march 2010. CRV and operational certification – eight martinis issue4, August 2010. RV Protocols – Part1 – Daz Smith, Lyn Buchanan & PJ Gaenir – eight martinis issue 7, May 2012. For the remote Viewing Record – eight martinis issue 8, November 2012. ROV RV – This is a small descriptive piece I wrote recently to explain my thinking of the Remote viewing process and how it appears to work for me. CRV Crib sheet – Things you may forget when in session, hints to make you get more data. Stage 5 – mindmap – Why I changed to a new way of doing Stage5 in CRV and how I do it. Tasking targets – A guide to setting up and tasking targets to get great data from remote viewers.